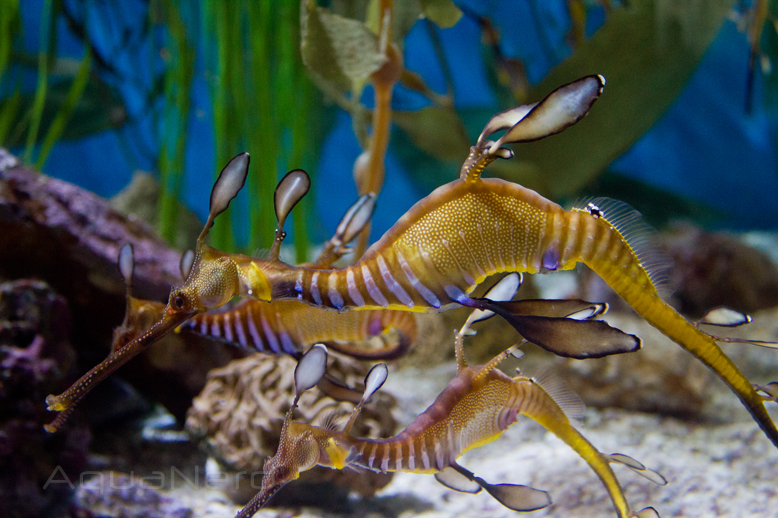 Sea dragons are a wondrous sight to behold. These extreme sea horses sport an elegant shape adorned with elaborate fins, and they captivate all audiences as they slowly drift through the water. We found ourselves mesmerized by these weedy sea dragons at the Aquarium of the Pacific a couple of months ago, and we couldn’t resist sharing this photograph we took. Despite their slow movement, they aren’t as easy to photograph as you might think. Besides the usual challenges of aquarium photography (reflections, glares, and anomalies in the glass), these Sygnathids are quite shy and escape to the back of the aquarium every time we pulled the camera out.